He appeared with Canadian Prime Minister Justin Trudeau and outgoing Mexican President Enrique Pena Nieto at the Group of 20 nations summit in Buenos Aires for the formal signing ceremony. Each country’s legislature must also approve the agreement. “It’s been long and hard. We’ve taken a lot of barbs and a little abuse, but we got there,” Trump said of the pact. Legislative approval is the next step in the process, but could prove to be a difficult task in the United States, especially now that Democrats — instead of Trump’s Republicans — will control the House of Representatives come January. Already Democrats and their allies in the labor movement are demanding changes to the agreement. 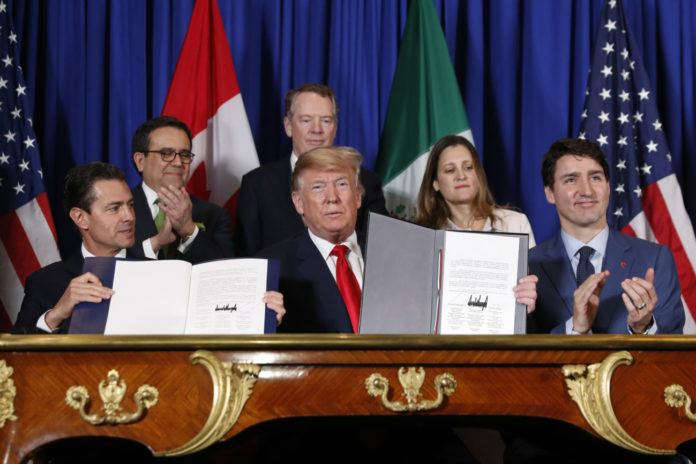 While Trump hailed the revised trade pact, Trudeau was more measured, saying there was still work to be done and calling on Trump — using his first name — to remove steel and aluminum tariffs the U.S. imposed on Canada and Mexico. Trudeau also referenced recent downsizing by General Motors in North America as a “heavy blow.” Trump did not mention the job losses. With his “America First” approach, general distaste for multinational deals and habit of insulting allies, Trump typically gets a mixed reception at global gatherings. Trump has slapped tariffs on the European Union, pulled the U.S. out of the landmark Paris Climate Accord and the Iran nuclear deal and suggested he might be willing to pull the U.S. out of NATO if member countries don’t significantly boost their defense spending.